Home › Latest News › "To Boston, With Love"
In the continued aftermath of the tragic events that occurred at the 117th running of the Boston Marathon, we are left with questions as to why, full of prayers they catch who, and hope for those affected. This week, our No Boundaries 5k & 10k training groups have dedicated their miles of training for those in Boston: the participants, first responders, spectators, and community. The events in Boston have left us torn emotionally, however we now have more resolve than ever to keep pushing ourselves harder and farther. 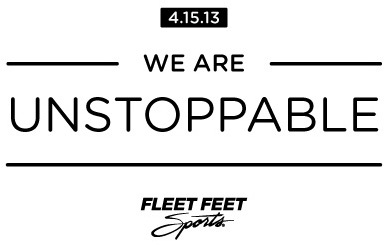 Together, we will keep the spirit of the people of Boston, the running community, and humanity, UNSTOPPABLE. We will be having a run/walk on Monday, April 22nd in support of the victims of the Boston tragedy. Click here to read more. Amy L. Marxkors, author of The Lola Papers: Marathons, Misadventures and How I Became a Serious Runner, wrote this article for Fleet Feet Sports St. Louis, and it articulates how we are runners, supporters and family are all feeling in the wake of the bombings. Thank you, Amy for putting into words what so many are feeling. "The spirit of the runner cannot be broken. It is a spirit of strength. Of faith. Of community. Of resilience. Of justice. Of freedom. It knows no barriers of language or ethnicity or gender. It knows not nationality or politics or age. It is not limited to those who run, but extends to their husbands and wives, mothers and fathers, sisters and brothers, children and friends. It reaches to complete strangers calling out words of encouragement and volunteers holding precious cups of water. It is a spirit of unity and support. It is a spirit that speaks not with words, but with actions. There are those who will try to break it, who will try to paralyze it with fear, who will try to inject it with trembling, violate it with terror, and intimidate it with threats. There are those who hate it. Who resent it. Who will try to crush it. They will hatch murderous plans and seek its destruction. But the spirit of the runner cannot be broken, because the spirit of the runner is the human spirit. The attacks at the Boston Marathon violated more than a race. The time and place were chosen to be as offensive as possible, to be a visible and flagrant affront to that which binds humanity as one. They were directed not just at the runners themselves, but at those we love—those who ride with us the daily ups and downs of training, who listen while we rattle off mile splits, who rejoice in our PRs, who commiserate when we fall short, who remind us to get off our feet the day before the race, who map out intricate race-day navigation plans to catch us at mile four. And ten. And sixteen. And twenty. Those who hold signs and ring cowbells. Those who cheer us on. Those who make it possible for us to reach the start line. Those who do so quietly, without asking for praise or acknowledgment. Those who wait for us at the finish. The attacks were calculated to ridicule freedom by victimizing the strong and murdering the innocent. They were intended to fell a community. They were designed to make a mockery of the human spirit. But far from achieving their aim, the attacks in Boston merely revealed terror’s own cowardice and futility. Even as it sought notoriety and fame, hate exposed its own impotence. In its presumption, fear paid the price of trampling sacred ground. Because even as the last reverberations from the explosion rumbled through the streets, those who were able rushed to the aid of the fallen. Even as the smoke rose from the wreckage, those who were strong carried the injured to safety. Even as the attacks were planned to create an environment of fear, division, and helplessness, it drove those very things away. Even as it sought to divide, it solidified our oneness, for in that moment there was neither runner nor spectator, neither friend nor stranger, neither elite nor volunteer. In that moment, we were one. Far from crippling the human spirit, the attacks in Boston galvanized its strength. We grieve the suffering of those injured and the loss of those who died. We feel the sorrow and pain of those affected. But we will not be broken and we will not surrender, for we are the caretakers of their memory. We are the ambassadors of their strength. Fear will not keep us from running. Terror will not stop us from racing. No, with every defiant mile, we will proclaim the triumph of the human spirit. We will proclaim it in the early morning before the sun rises and late in the evening when the sun has set. We will proclaim it in the rain, in the cold, in the snow, in the heat, in the wind, and in the fiercest storms. We will proclaim it in the grandest stages of sport, and we will proclaim it when no one is looking. We will proclaim it in the company of others. We will proclaim it in the loneliest of miles. We will proclaim it through pain. We will proclaim it through joy. We will proclaim it even in the midst of tragedy. For those who conspire to destroy will fail, their plans will come to ruin, their names will fade away and be remembered no more. But we will not lose heart. We will not surrender. 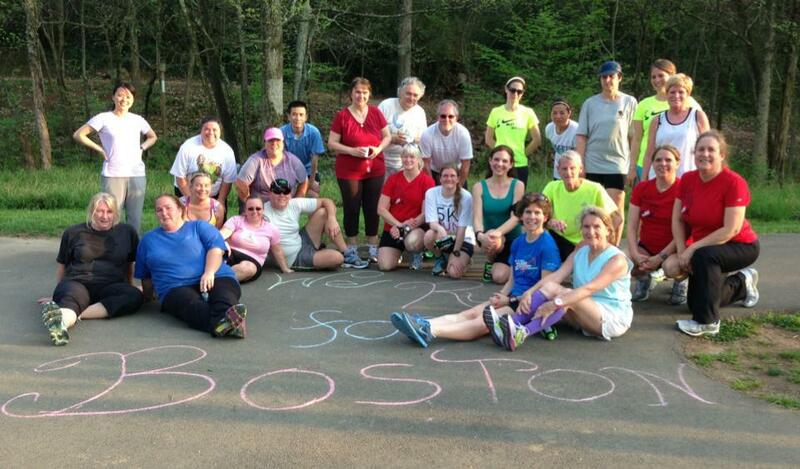 For the spirit of the Boston Marathon is the human spirit, and it will never, ever be broken. To visit Fleet Feet Sports St. Louis's page, click here.